For those who like process talk, I did a little interview with the Comics Manifest a few weeks ago and it is posted now. I was really surprised at the quality of the questions and also of his other interview subjects… some pretty big names in there. And now me, lol. Anyways, feel free to check it and out the site and follow the Twitter for some comic-making positivity. Why hello Bex, Please don’t bludgeon the nice arm-shark, Kalla really is not as fearsome as it would appear. Whoa. So, did they find them? Hmm… This suggests the light is behind the person/thing approaching… or do we just ignore that for effect? I *think* I may understand it. 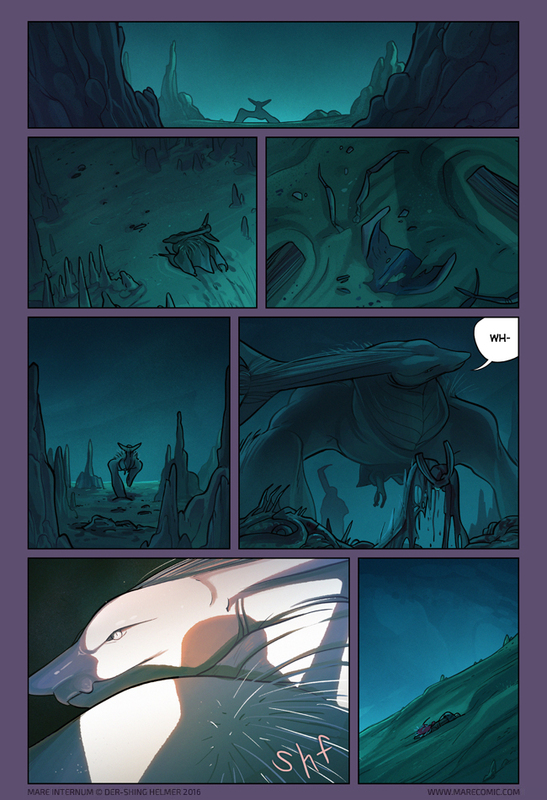 If that’s Bex, then the shadow in the upper right of panel 6 is the sickle-like object she is holding up in front of her, and the other shadow is cast by Kallakore’s leg spikes. Yikes, dead thrips? Doesn’t look like a good corner to hang around. Looks like a baby armshark to me. Bex with pickaxe. She’s gonna dig out Martian Secrets, all of them! D) Someone actually wants to give Kalla some tasty baked treats. Dangit, Mystery Silhouette, don’t you know it’s bad etiquette to take selfies with other people without asking permission first? Also, you’re going to have some serious red-eye with that flash. Glad you liked it! I really liked the types of questions he asked, some good big-picture discussions in the other podcasts too. Bex, we know you’re hungry, but Kalla is friend not food! Gah! I just found this comic a few days ago and read from the start (while compiling) and was NOT prepared to suddenly arrive at the current page. Being accustomed to reading a few dozen pages a day, this cold turkey gonna hurt! i found website. crashed thru it . had to wait for a interval and now have to go day by day. oh the slow of it all. i have to know what happens next. That’s clearly an Uruk-hai brandishing one of their funky angular swords in the 5th panel! Where’s a Boromir to recieve all the hits when you need him? Mike could work in a pinch! Umm, I really hope that’s not a processor. In that last panel… is that Michael laying face down? All I can think is it’s his dead body – proof he’s now caught in the system with Kalla? I know I’m just wildly speculating, but I can imagine a Michael body at every place he’s been significantly physically hurt thus far in the Mare Inturnum. ….Which would be an incredibly creepy trail for Bex & the others to follow if they do come down to join the party. So Mike made a good friend that he trusts, and now he’ll think he’s been abandoned. I predict he’ll respond to this in an entirely rational manner, remaining calm and collected while not in any way panicking or experiencing flashbacks of trauma. Sudden bright light in a mostly-dark environment where things use bioluminescence to communicate? Predator ‘flashing’ to stun, perhaps? Also, big pile of glop Kalla is looking at is MUCH too big to just be a dead thrip, even if it has dead thrip bits near it. Bex returns, lighting a flare? Judging based on the light and the “Shf” sound, which could totally describe a flare. Nope, it’s should be sensitive “whiskers” on her (Kalla) back. The problem with finding great new comics is binging through the archives and suddenly reaching the end and having to wait for more at the normal pace. I now see this page in a totally different, uh, light. … I swear that pun wasn’t intentional. Your depiction of Kallakore reminds me of the art by Rodney Matthews for the cover of The Forgotten Beasts of Eld. I like!